Experience the atmosphere of the "Dolce Vita"
The Legendary Harry's Bar the only place that evokes the "Dolce Vita" as if it were an image from the film, creating a flashback in the era of Via Veneto, when Frank Sinatra was playing the piano and the stars made their appearance in this American Bar full of glamor and style. As in the roaring sixties, you can still have a drink, enjoy the piano bar every night and soak in the magic of Via Veneto in the exclusive and fascinating Harry's Bar. To write the history of this place we should be able to meet all the people who have attended, or a good part of these. Surely each of them would have a piece of history concealed in the shrine of their own memories. Memories of unforgettable moments, but above all a part of history that has helped to revive our country. Was the '60s and our local, proudly represented the meeting point of Rome "by night", the "sweet life", the place where the tumultuous love affairs were born, where they signed agreements never revealed, where everything was familiar. This was Harry's Bar. In the heart of those who attended never died, despite the difficult years. 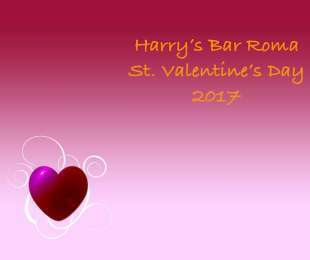 Harry's Bar Rome was founded in 1959, will be known only in 1962 but the club already existed since 1918. It was the pastry Golden Gate also quoted in numerous books. In the late 20 became part of the family De Gasperis until 1958 precisely when it became American Bar Restaurant. Rooms full of history and charm, sophisticated and extremely smart make the difference: listen to the notes of the piano bar while sipping a drink, dine on the extensive menu, they become exclusive rites of pleasure. The refined cuisine draws Mediterranean flavors based on main ingredients, tradition and imagination inspires elegant dishes on the menu, accompanied by the best prestigious labels and a high level service. It's a great pleasure for me to have spent a wonderful evening in this famous club. I did not know your local and I have to say to be fascinated. Congratulations.